Just as the aviation industry was headed toward recovery after its plunge following 9/11, the 2008 financial crisis hit, sparking additional dramatic change in the industry. Airline consolidation resulted in hub closures and flight reductions at many airports. Capacity discipline practices changed the landscape of airline services at airports across the country. Between 2006 and 2009, the number of available seats at U.S. airports dropped by 11 percent and the number of flights fell 13 percent. Air service is more than just flights and seats. It’s about connecting to major centers of domestic and international activity. Since then, flights have continued to decline slightly while seats have increased modestly. But these aggregated numbers don’t tell the full story of what matters to passengers – how the air travel options and cost to get to where they want to go have been impacted. At GRA, Incorporated, we are developing tools that go beyond standard analyses of changes in the number of airline seats and flights. These tools reveal how the relative economic connectedness of U.S. airports has changed since 2006. Greater connectivity means more opportunities – for airports, for businesses, for air travelers and for local economies. The GRA Service Index (GRASI) we’ve developed allows airports, airlines, passengers, businesses and local government leaders to assess what is happening to the air service available at individual airports and to evaluate how they are performing in terms of connectivity relative to similar airports. GRASI is unique, in that it measures both connectivity and economic access. GRASI is unique, in that it measures both connectivity and economic access. Our index quantifies service from an airport to a set of 50 domestic and 17 international airports in cities that account for a substantial share of global economic activity. Airport service is weighted by destination GDP, placing higher value on routes to economic hotspots. It accounts for available seats, aircraft type, and the number of weekly flights (nonstop, one stop and two stop), counting only legal and competitive connections with appropriate adjustments for online, code share and interline quality of service. GRASI ranges from zero to 10,000 points, which allows an airport to evaluate its access to global centers of economic activity relative to that of its peers. Additionally, GRASI tracks variation in airport network access over time, demonstrating how external factors – such as the financial crisis, fuel prices and airline consolidation – have affected air service in airports and in cities. GRASI ranges from zero to 10,000 points, which allows an airport to evaluate its access to global centers of economic activity relative to that of its peers. What have we discovered from GRASI? Well, airports haven’t been affected equally by recent changes—and the differences are greater than one may think. While large variation in index scores across airport hub groups is endogenous to our model (large hubs have more frequent and varied service than medium hubs, and small hubs have even less service options), we observe disproportional changes in connectivity quality among the hub groups over the past eight years. These changes are similar to the changes in available seats across hub groups over the same period. The figure below depicts changes in both seats and connectivity by airport size since 2006 (using 2013 hub classifications). Between 2006 and 2014, both small and medium hubs have experienced decreases in GRASI of 17 percent, while encountering losses of a similar magnitude in available seats. 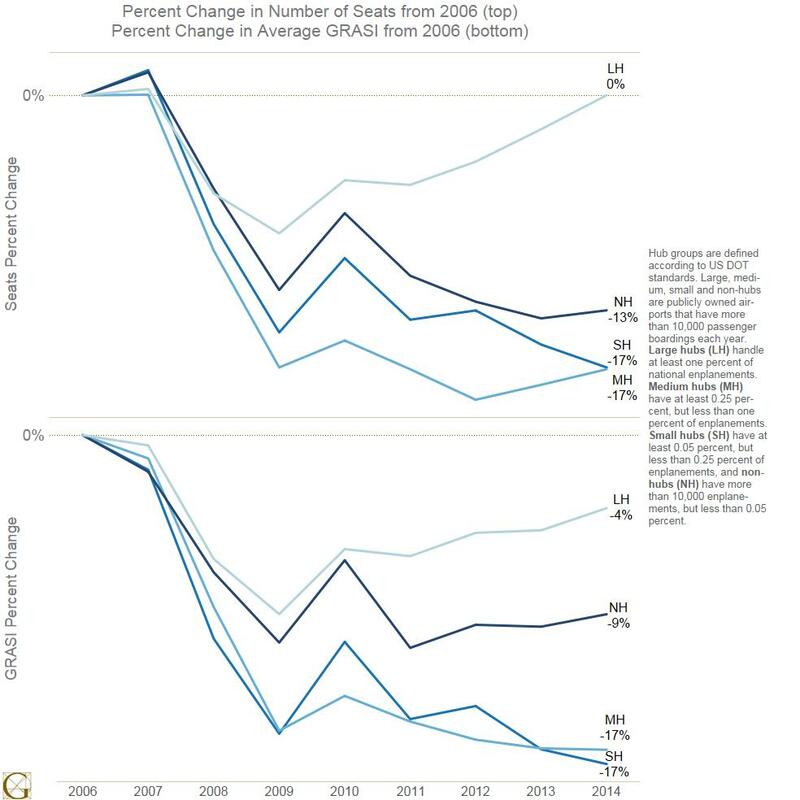 While large hubs have recovered nearly all losses in available seats over the past eight years, the average GRASI of the hub group remains four percent below 2006 levels. In contrast, non-hubs experienced a nine percent GRASI decrease, on average, but have 13 percent fewer available seats than they did eight years ago. There are significant differences in connectivity growth rates within airport hub groups as well, as shown in the charts below. Among large hubs, San Francisco International Airport (SFO) and Miami International Airport (MIA) experienced the greatest connectivity increases. 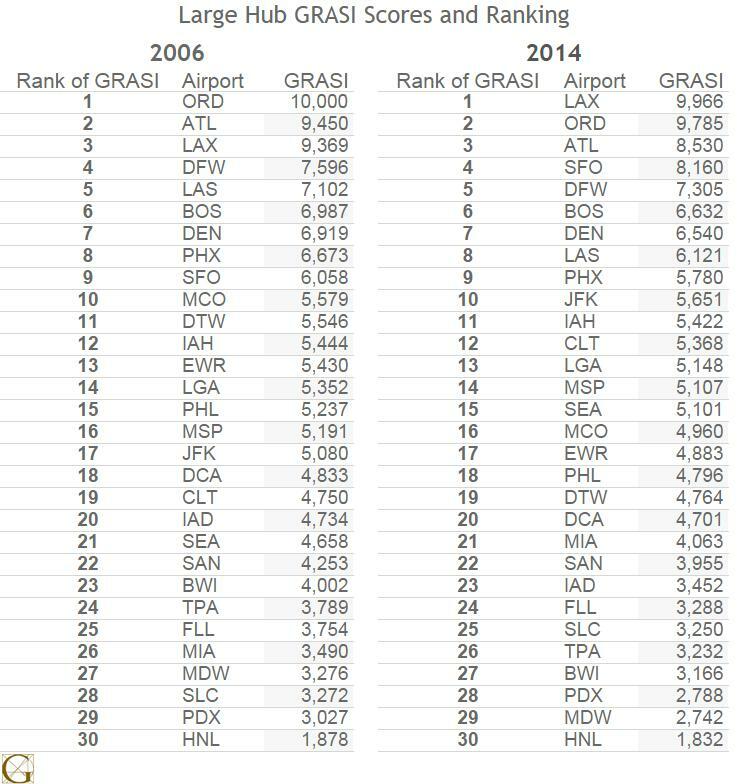 SFO’s GRASI score increased 35 percent, improving the airport’s rank from ninth to fourth between 2006 and 2014. A 16 percent connectivity increase at MIA moved the airport from 26th place in 2006 to 21st place in 2014. JFK also experienced considerable rank gains, moving from 17th to 10th with an 11 percent increase in connectivity during that period. Click here to see large hub GRASI scores and ranking for 2006 and 2014. Reduced access to key economic centers can inhibit economic growth in small cities by discouraging businesses from locating or expanding in these poorly connected areas. And yet such gains are not experienced uniformly across airports within a metropolitan area. GRASI can be used to highlight and quantify these changing dynamics. For example, while JFK experienced significant increases in connectivity, LaGuardia Airport (LGA) and Newark Liberty International Airport (EWR) suffered from connectivity losses of four and 10 percent, respectively. This resulted in EWR moving down four spots in rank, to 17th, during this period. While LGA actually moved up one spot in the rankings, from 14th to 13th, the airport’s GRASI score of 5,148 is still nine percent lower than JFK’s—in contrast to a GRASI score that was five percent higher than JFK’s in 2006. The largest connectivity losses among large hubs between 2006 and 2014 were those at Washington Dulles International Airport (IAD) and Baltimore-Washington International Airport (BWI). IAD’s connectivity loss of 27 percent moved it down three spots in rank, to 23rd place , while BWI ‘s 21 percent loss of connectivity bumped the airport from 23rd to 27th place. The third major airport in the Washington, D.C. metropolitan area, Reagan National Airport (DCA) experienced a three percent connectivity loss. DCA was ranked 18th in 2006 and 20th in 2014. In contrast to IAD and BWI, some airports experienced significant losses in connectivity while maintaining a GRASI score that ranks above the large hub median score. For example, Phoenix Sky Harbor International Airport (PHX) and McCarran International Airport (LAS) experienced connectivity losses of 13 and 14 percent, respectively between 2006 and 2014. However, PHX dropped only one spot in rank—to ninth place—during this period, with a current GRASI of 5,780. And although LAS moved down to eighth place from fifth, the airport has a current GRASI of 6,121, which is 20 percent greater than the large hub median. Explanations for these changes in economic connectivity, such as weak passenger demand, consolidation and capacity discipline practices, are largely responses to the economic downturn and high and volatile fuel prices. The effects of these changes are significant not only for airports and passengers, however. Reduced access to key economic centers can inhibit economic growth in small cities by discouraging businesses from locating or expanding in these poorly connected areas. For city planners and developers, GRA has been developing measures of airport economic access costs, which can be valuable tools to examine how the time and money required to travel from a city can stimulate—or stifle—its growth and development. For more information, contact GRA, Incorporated here. To see more from GRA, follow us on LinkedIn. Note: 2014 GRASI scores are estimates based on data from the first three quarters of 2014. Results are reported according to 2013 airport hub groups. The domestic airports used in this analysis are located in cities that account for 2/3 of U.S. GDP. The international airports were selected by GRA, based on enplanements and according to our judgment of their global significance.